To Kollskegg on the "Ships starting with K" page. Built by Eriksbergs Mekaniske Verkstads A/B, Gothenburg, delivered in 1940. Captains: Ole Sørensen, later Leif Søyland. *Arrived Falmouth? - See narrative below. July 21 St Helens Roads St Helens Roads July 21 CW 7 Damaged by aircraft, returned (see narrative below). June 28 Loch Ewe Halifax* July 12 OB 339 For Aruba. *Convoy OB 339 did arrive Halifax on July 12, but Kollskegg arrived Aruba on July 20 - again, see Page 1. The document now shows a number of subsequent voyages that are not included in A. Hague's record. (Page 1 gives arrival New York Jan. 3-1942). As will be seen when going to Page 1 of the archive documents, Kollskegg was on her way from Tuxpan to Venice when war broke out in Norway on Apr. 9-1940. She was diverted to Southampton, where she arrived, via Hampton Roads and Gibraltar, on July 7. She's listed in the convoy in which M/S Tudor was sunk on June 19, namely Convoy HGF 34, which had sailed from Gibraltar on June 13. Nina Borthen, John P. Pedersen and Svein Jarl are also included. The 2 British ships Baron Loudoun and British Monarch were also sunk in this convoy, by the same U-boat as sank Tudor (U-48), while the British Otterpool was sunk the next day by U-30. According to a personal story found in "Krigsseileren" No. 1 for 1974, Kollskegg left the convoy after a British ship had been sunk and continued alone at full speed, the captain being severely reprimanded on arrival Falmouth for going against orders, though they had arrived safely with 15 000 tons oil. The next day they were ordered to Southampton, where they arrived to complete chaos with ships arriving continuously, carrying refugees from France. After several weeks they were finally able to unload the oil (this does not quite match up with the details found on the archive document, which says Kollskegg arrived Southampton on July 7, as mentioned, and left again on the 13th, though it'll be noticed that she did spend a long time in Southampton later on, but this was after having been attacked by aircraft). She was in the westbound Convoy CW 7 (external link) which was attacked several times by a total of nearly 80 aircraft on July 21-1940. 12 planes attacked Kollskegg, 5 bombs hit, 3 of which went through the bottom of her without detonating, but 2 of them caused serious damage. Incendiary bombs set her on fire, a British gunner was killed, 4 crew seriously injured and 3 others less seriously. She was taken in tow and the crew taken to Portland. Kollskegg was at first beached at Dunnose, Isle of Wight, and then towed to a yard for repairs on the 23rd. 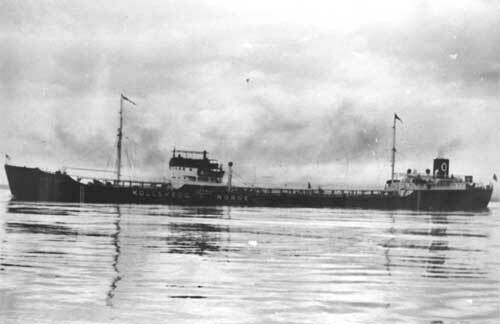 The Norwegian tanker Nina Borthen was also damaged in this attack; follow the link for details. The personal story mentioned also describes this attack, slightly different (article written in 1969). The author says they were hit by 4 bombs, 3 of which hit the foredeck, the mast flying overboard, and the 4th bomb hit the bridge, going through to a tank where it exploded. Thick crude oil "rained" from the tanks all over the ship (reports state she was in ballast), and soon the foredeck and the bridge were in flames. The British gunner was killed when he was blown down to the after deck. They all went on board a destroyer, taking the gunner with them. Meanwhile, Kollskegg's bow was hit by an air torpedo, then the wind and current took the burning wreck towards shore where she later stranded. He says they were landed at Evermouth that evening (July 21), then sent to London the following day. After a couple of weeks they were sent back on board the burnt out Kollskegg and she was taken to dock at Southampton for repairs. He adds that Southampton was "sheer hell at that time, with air attacks 12 hours a day". In Sept.-1940 they headed out to sea again, arriving South Bank 4 days later, and straight into dock, while the crew lived ashore, until she was ready to sail in June-1941. Again, see also Page 1. She's listed as bound for Aruba in Convoy OB 339, which originated in Liverpool on June 26-1941 and arrived Halifax on July 12; Kollskegg arrived Aruba on July 20, having sailed from Loch Ewe on June 28, according to the archive document - ref. external link provided in the Voyage Record for more on this convoy, Mosli and Suderøy are also listed. The author of the above story says they made 2 voyages to South Africa alone, before heading back to the U.K. She's included in Convoy HX 160 from Halifax on Nov. 15 (Montbretia is named among the escorts), and the following month we find her in the westbound North Atlantic Convoy ON 48, departing Liverpool on Dec. 19, dispersed on the 31st, Kollskegg arriving New York on Jan. 3-1942. This convoy, which also had Athos, Buenos Aires, Chr. Th. Boe, Grena, Havkong, Havprins, Heranger, Høegh Scout, Nueva Andalucia, Solfonn, Solstad (returned) and Sveve in its ranks, will be added to an individual page in my Convoys section; in the meantime, the ships sailing in it are named in the section listing ships in all ON convoys. On Jan. 26-1942, Kollskegg is listed in station 43 of the Halifax-U.K. Convoy HX 172. At the beginning of March that same year she shows up, along with Fana, Petter and Triton, in Convoy OS 21, which originated in Liverpool on March 4 and arrived Freetown on the 24th (also available via the external link provided in the table above). Kollskegg's destination is given as Aruba (station 65); she arrived Curacao on March 26, having started out from Belfast Lough on the 5th - her voyages in this period are shown on Page 2. Note that some of the dates and facts are a little different from the above. I've chosen to add all the information available to me on her loss, from several different sources (named at the end of this page). Captain Leif Søyland. Kollskegg left Willemstad, Curacao again on March 29-1942 in order to return to the U.K., via Halifax for convoy. She had a cargo of about 8000 tons of Colon residue and about 6300 tons of fuel oil for the Anglo American Oil Company. On Apr. 6-1942 she was torpedoed by U-754 (Oestermann), the torpedo hitting on the starboard side amidships, abaft the pump room, tearing a large hole in No. 15 tank below the bridge super structure, but though listing heavily (20°-25° to starboard), she stayed afloat. The officer on duty (2nd mate) immediately ordered the engines stopped and the crew to the boats, setting off the emergency alarm, but Captain Søyland, who had been resting in his cabin when the attack occurred, withdrew this order as soon as he arrived on the bridge. There's some conflicting information as to who did what, and how many boats were launched. The captain stated at the subsequent maritime hearings that when he came to the lower bridge he noticed that some of the crew were in the process of lowering one of the boats on the port side, and immediately gave the orders for this to stop (this was the midships motorboat, which was lost when it went adrift empty). He also saw that a boat had been put on the water on the port side aft (this was later hoisted back on board), and another was almost on the water on the starboard side. Realizing the ship would remain afloat he ordered full ahead. By that time one of the lifeboats with 10x men (possibly the starboard boat mentioned above?) was so far behind the ship that the captain made the decision to leave it, as there was a U-boat in the vicinity. He sent out a radio message about their situation, then set a course for Hampton Roads, Virginia at full speed in the hope of getting away from the attacker, but the U-boat followed and Kollskegg was torpedoed in the engine room, starboard side that evening (apparently 15°-20° on the starboard quarter), inflicting heavy damage to the engine room, stopping the engines. The stern was practically blown to pieces, and she sank within 4 minutes. 2 men were killed in the latter attack, namely 2nd Engineer Arthur Gundersen, who had been in the engine room, and Steward Henry Pedersen who was on the bridge at the time of the explosion and was believed to have gone to his cabin afterwards. The survivors took to the lifeboat, and this means that 5 lifeboats from two ships of the same company were drifting on the ocean east of Cape Hatteras on April 7, with a total of almost 80 men (see M/T Koll). Captain Søyland's boat was located by a Panamanian ship (Bushranger) after 21 hours and the men landed in Nassau on the Bahamas in the evening of Apr. 11-1942. Towards evening of the 7th the other lifeboat from Kollskegg had been in contact with 2 boats from Koll, and they stayed together for a while, but the near gale force wind separated them again. At 13:17Z on the 14th a Canadian warship (HMCS Niagara) rescued the people in this boat (in 39 08N 64 59W) and took them to Halifax. (I've come across a statement in the Norwegian magazine "Krigsseileren", Issue No. 2 for 1975, which says that after the first torpedo hit, 3 boats were launched without orders, and 1 of them was never found again; 10 men disappeared. It would seem that these men would be commemorated at the Stavern Memorial, but they are not - this is obviously incorrect, and is probably the boat whose 8 occupants were picked up on the 14th). xAccording to Captain Søiland's statements to the Norwegian Consul at Nassau on Apr. 13-1942, there were 10 men in the "missing lifeboat", and he lists them by name - they are denoted * in the crew list. However, it appears the 2 British boys were not in this boat. Electrician Kilmark stated at the hearings in New York on Apr. 30-1942 that when he came out on deck after the 1st explosion he saw that 2 British boys had started to launch the port boat aft (this was the boat that according to the captain was later hoisted back on board). The electrician had tried to stop them, but they appeared to be in a panic, so there was nothing he could do. "Nortraships flåte" says there had been a problem while launching one of the lifeboats, resulting in 2 young British boys drowning. If this was the case, there were only 8 men in the boat that was picked up by HMCS Niagara on the 14th. Captain Søiland gives the time for the first attack as 14:20 on the 6th, 33 01N 68 48W, and for the 2nd attack he gives the time 19:30 on the same date (ship's time). Page 2 of the archive documents gives the time as 18:50 GMT. J. Rohwer only mentions one attack, giving the German time 20:58 on the 6th and the position 34 58N 68 38W, while Roger W. Jordan's "The World's Merchant Fleets 1939" gives the position 35 01N 68 49W, and says she was torpedoed again on Apr. 7 and sunk in 35 20N 70 03W, adding that 4 died, 38 survived. Charles Hocking simply gives the position as "350 miles northwest of the Bermudas", voyage from Curacao to Halifax with 14000 tons of crude oil (he says 5 men were lost). A sinking report, based on subsequent interviews with the survivors (from Navy Department, Office of the Chief of Naval Operations, Washington, a memorandum dated May 25-1942 and signed by U.S.N.R. Ensign A. J. Powers), gives the time of the first attack as 18:50 GCT, Apr. 6 in 35 01N 68 49W, and as 00:00 GCT Apr. 6/7 in 35 20N 70 03W for the second attack, adding that 30 crew abandoned ship in 2 lifeboats 4 minutes later (sinking time 00:04 GCT, Apr. 7). These 30 were picked up at dusk Apr. 7 by Bushranger and landed at Nassau Apr. 11-1942, as already stated. This report also says that she had been on a course 018° true until after the first torpedo hit, when a course of 283° true was set for the nearest port at a speed of 12 knots. She had not been zig-zagging before the first attack but did so afterwards because she could not be held to a true course. The radio had not been used. There were 5 lookouts at the time, 2 on flying bridge, 2nd mate and helmsman on the bridge and gunner on the after deck. The weather was fair, broken clouds, wind WSW force 2, visibility good, sea calm, no ships in sight. Another report (from District Intelligence Officer, 7th Naval District, Miami, to Chief of Naval Operations), dated May 8-1942, states that the 30 survivors in 2 lifeboats who were picked up by Bushranger and landed at Nassau were later brought to Miami on Apr. 23 aboard the British Ena K (note, however, that 3 of these were, in fact, left behind in Nassau, and only Captain Søyland and 26 crew arrived Miami on Apr. 23 - see note further down on this page). Kollskegg had 2 guns aft, one 4.7", the other 37mm, alertly manned during the attack and subsequent chase by Norwegian Naval crew, but the target was never seen so the guns were not used. An Intelligence Report, based on statements given by the captain in Miami in an interview with U.S.N.R. Ensign George V. Salzer Jr., dated Apr. 23-1942, states that the ship was abandoned 60 miles along course 283° true from 35 01N 68 49W. When the attack commenced (in 018° true), Kollskegg was doing 11 3/4 knots, and the same speed at 283° true after the 1st torpedo and before the 2nd. The U-boat or perisope were never seen, but the gunner saw the track of the last torpedo. The captain says that she also had a 1/2" gun and 4 Hotchkiss in addition to those already mentioned above. She was also equipped with smoke apparatus, which was not used. Total complement of 42, 7 British, 1 Swede, 1 Chilean, 33 Norwegians. 3 men were admitted to a hospital in Nassau, denoted ** in the crew list, and 27 (including the captain) arrived Miami on Apr. 23, denoted *. According to a letter, dated July 1-1942, from the American Consul General in Nassau (John W. Dye) to Francis J. H. Dever, Inspector in Charge of Immigraion, Thomas Frederick Browne and Einar Grønning had been unable to accompany the other members of the crew on Apr. 23. They did not leave Nassau until July 1 on board M/V Ena-K, arriving Miami July 2. Another letter, dated July 15-1942, states that Harald Haugvik (who had also remained in hospital in Nassau) was at that time due to leave Nassau on board M/V Betty-K on July 17-1942, expected to arrive in Miami on July 18. As mentioned, the maritime hearings were held in New York on Apr. 30-1942. The following appeared: Able Seaman Høiseth (helmsman during the 1st attack), Able Seaman Klepp (lookout, 1st attack), Gunner Hogstad (on duty by the aft gun, 1st attack), Electrician Kilmark, 3rd Engineer Jensen and 2nd Mate Karlsen (officer on watch, 1st attack). By that time they had learned that the men in the other lifeboat had been rescued and taken to Halifax. For info, U-754 had also been responsible for the attacks on Belize and William Hansen earlier that year - follow the links for details. Able Seaman John Høiseth later joined Skiensfjord - his other ships are listed on this external page. * Denotes those who were brought to Miami on Apr. 23, 3 men having been admitted to a hospital at Nassau (**). * These 10 men are listed in the captain's statement to the Consul at Nassau (on Apr. 13) as being in the "missing lifeboat". As mentioned, the 2 British boys were probably not in this lifeboat, leaving only 8. ** Billy McGee, England has told me that the 17 year old Norman Hunter from Ellesmere Port, Cheshire is commemorated at Tower Hill, Panel 130. Further details on him can be found on this page at the Commonwealth War Graves Comm. website (listed as "Assistant Steward"). Ronald Porter does not appear to be commemorated. Stavern Memorial commemorations - Norwegians only are commemorated at this memorial for seamen in Stavern, Norway. In addition to the 2 named above there's an Able Seaman Sigvart Osvald Berstad. Checking with "Våre falne", which lists Norwegians who lost their lives in WW II, I find that he had died during a bombing raid on London on Oct. 13-1940, and is buried at the Norwegian cemetery there. Back to Kollskegg on the "Ships starting with K" page. The text on this page was compiled with the help of: "Nortraships flåte", J. R. Hegland, "Krigsseileren" No. 1, 1974, No. 2, 1975, "Sjøforklaringer fra 2. verdenskrig", Norwegian Maritime Museum, Volume I, and misc. others as mentioned in the above narrative - ref. My sources. Summary of statements by survivors was received from Tony Cooper, England, other reports and orignal letters from Eric Wiberg.